Mahakali puja should be performed a place where you keep your money or safe. Purify the place with gangajal and make a rangoli with beautiful colors and flowers. 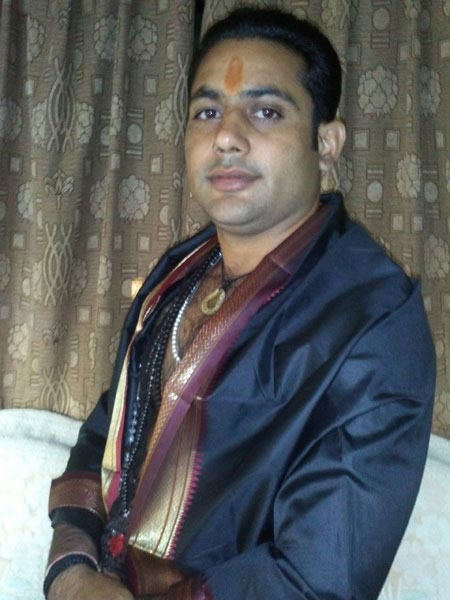 Take bath in the evening and wear new clothes before commencing the prayer. "Om krim krim krim hrim hrim hrim hum hum dakshin kalike krim krim krim hrim hrim hrim hum hum thaha thaha swaha"
"Om Trim Trim Trim hrim hrim hrim hum hum Dakshin kalike trim trim trim hrim hrim hrim hum hum thaha thaha swaha"
Goddess Kali , also known as MahaKali is one of the forms of Dasamahavidya goddesses associated with Shakti. She is also known as Bhavatarini meaning the redeemer of the Universe. She is often represented as the consort of Lord Shiva on whose body she is seen standing. She is often depicted as dark blue in colour and wears a garland of skulls. She has her long tongue sticking out and is laughing. Sometimes instead of a tongue she is shown as having two fangs. 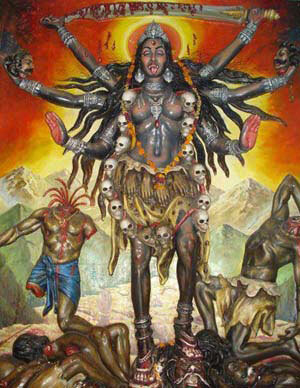 Kali has four arms and holds a head chopper wih one hand and a severed head dripping blood in another hand. With her other two hands, she makes the mudras of bestowing boons and dispelling fear. She wears a skirt made of human arms. Kali is portrayed as dancing in a cremation ground and standing on a corpse who is the form of Lord Shiva himself. Legend has it that she was manifested to kill the demon Rakthabeejasur who was wrecking havoc in the world. The Gods found it impossible to kill him as he would multiply with every drop of his blood, So they requested the Goddess to save them and then she took a fierce form and started killing all the demons. But her thirst for blood could not be calmed even after killing the demons and it became impossible to control her. Then Lord Shiva himself came in her path and laid down. It was only when she stepped on his chest, that she realised what she was doing and calmed down. She was the main diety worshipped by Ramakrishna Paramahamsa. She blessed him with astha siddhis and he dedicated his life for the worship of Goddess Kali.